The organ is an instrument used for centuries to help express our faith in liturgy and song. There are a great many types of organs available, and a host of options for the selection and design of instruments. The objective is to assist worship space architects and planners in designing functionally and acoustically appropriate spaces for organs. Descriptions of and considerations for digital and pipe organs will be included. Related topics discussed will include organ types, size, space allotment, location, proximities, layouts, as well as acoustic considerations, technical infrastructure, aesthetics, and care and maintenance factors. Scott Riedel graduated from the University Of Wisconsin-Milwaukee School of Architecture and the Wisconsin Conservatory of Music. He is Organist-Choirmaster at Christ Church, Episcopal, Whitefish Bay, Wisconsin, and has taught the Science of Acoustics course at Columbia College Chicago. Mr. Riedel has consulted on the design and installation of hundreds of new, rebuilt, and re-located heritage pipe organs throughout the United States. He is published in the “GIA Quarterly”, “The Diapason”, “CrossAccent” (Association or Lutheran Church Musicians), and the Yale Institute of Sacred Music “Review” magazines. He has presented lectures on acoustics and organs to the Association of Lutheran Church Musicians, National Association of Pastoral Musicians, American Guild of Organist, American Institute of Architects, and The Acoustical Society of America. November 2018 Webinar – “Designing and Specifying New Stained Glass Windows”, presented by Bovard Studio Inc.
3. Review materials, types of glass, glass painting, etc. 6. Review safety and environmental procedures for working with lead in stained glass windows. Ron Bovard started in 1971 as an independent artist and had his first art show at Carnegie Museum in 1972. He enjoyed a career as an independent artist and art director for 14 years before starting Bovard Studio Stained Glass in 1985. Since then, he has grown his company to a staff of over 70 employees, including artists, painters and designers from around the world as well as fabricators, restoration staff and installers. Their engineering staff has designed and tested their glazing systems at the National Testing Laboratories and they are now approved by the state of Florida for the maximum hurricane wind load and impact codes. 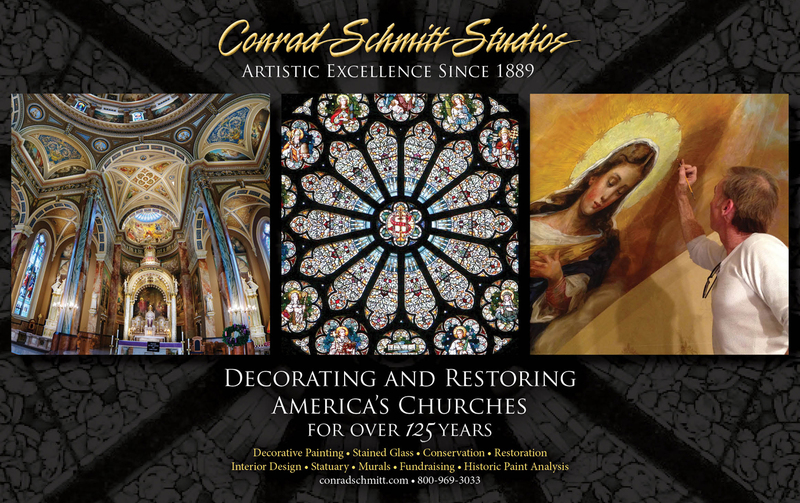 They manufacture their US patented wood, aluminum and steel frames designed for the conservation of stained glass windows in their studio’s frame shops. They restore and create stained glass windows and glazing systems for about 150 churches, courthouses, hospitals, libraries, state capitols, and other public buildings per year. This webinar will be held on Tuesday, November 20, 2018 at 1:00 PM ET. To register, please click here. Many liturgical churches have adopted wholesale the use of media in worship as audiovisual support/communications billboard, a model developed in the evangelical megachurches since the late 1970s. Unfortunately, that model typically treats media as presentation technology. Appropriately integrated within liturgy, though, media art in worship (photography and video) can do and be more than that. It can be liturgical art that can serve as media of meditation and as environmental art. It can be intentionally designed and created to serve as art that communicates on its own and is experienced as symbolic, polyvalent, metaphorical art. 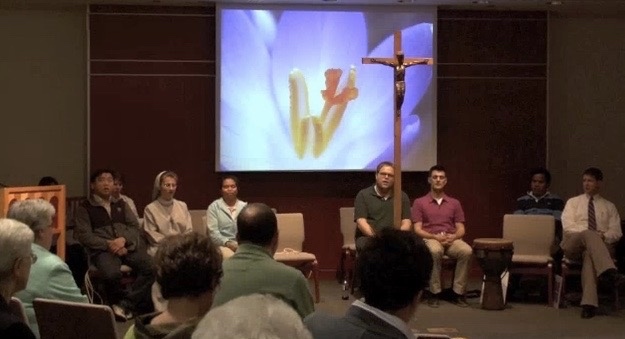 To prepare to serve clients who ask, “Were shall we put the projection screen?” liturgical consultants and architects can benefit from exposure to the experiments of media installation artists of the late 20th and 21st century, such as Nam June Paik, Bill Viola, and Diana Thater. New possibilities await those who are willing to learn from today’s artists and innovators regarding new methods for display of media art. Eileen D. Crowley, Ph.D., Associate Professor of Liturgy, Arts and Communications at Catholic Theological Union, Chicago, has been researching the topic of media art in worship for more than two decades. She is the author of Liturgical Art for a Media Culture(Liturgical Press, 2007) and A Moving Word: Media Art in Worship(Augsburg Press, 2006) and many scholarly and popular essays on the topic. She earned her Ph.D. in Worship and Preaching Studies at Union Theological Seminary (New York City) and her M.A. in Theology (Liturgical Studies) from the University of Notre Dame (Indiana). This webinar will be held on Tuesday, October 16, 2018 at 1:00 PM EDT. You can register for this webinar by clicking here. This webinar will examine the unique Design-Build approach used by Design Fugitives and Gilbert Sunghera, SJ for delivering holistic and cohesive art and furnishings for Sacred Spaces. Looking at the process of this approach compared to traditional project delivery methods will bring to light what makes this Design-Build approach valuable and distinct, and what sacred project types might benefit most from it. Three ecclesiastic projects of various scope and size will be used as case studies. Attendees will gain a deeper understanding of why Design Fugitives has developed this approach for sacred space projects, how this process works, its pros and cons, and some of the technological advances that enable it. Paul Mattek is the Founding Partner of the commercial art studio Design Fugitives. He leads a team of 10 in creating mixed-media art and furnishings in the US and internationally. His work resides in places such as corporate atria, institutional lobbies, and places of worship. 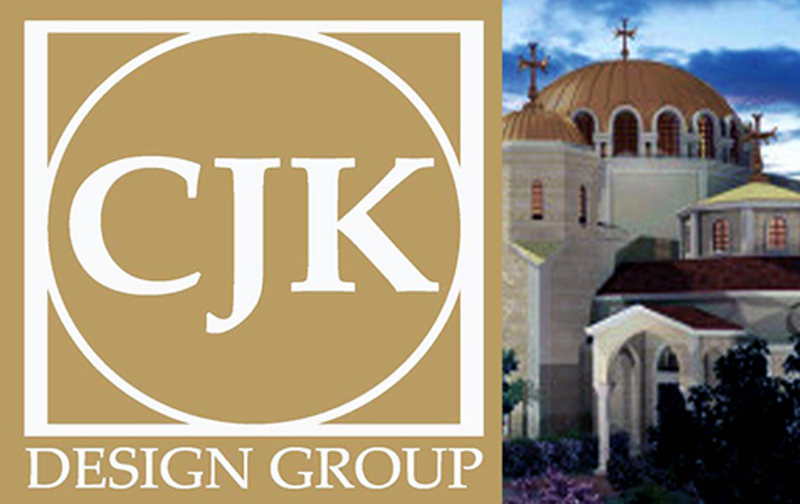 Since 2011, Paul has partnered with Gilbert Sunghera, SJ of the University of Detroit Mercy to execute several sacred space design-build projects. Prior to founding Design Fugitives, Paul studied and gained advanced degrees in the fields of Divinity and Architecture. This webinar will be held on Tuesday, Sept. 18, 2018 at 1:00 PM ET. You can register at https://attendee.gotowebinar.com/register/5462033305408296707.